The NSW Department of Primary Industries is involved in numerous research, conservation management and habitat restoration projects which contribute to the well being of threatened species. Here you will find some information on some of the programs that the Department is running or is contributing to. Other organisations such as local councils, local land services, universities, fishing groups, landholders and conservation groups are also critical to the delivery of some of these programs. An exciting and much-needed initiative has just commenced on the NSW Southern Highlands to extend a helping hand to one of Australia’s most threatened aquatic species. South East Local Land Services and NSW Department of Primary Industries Fisheries, with support from the Australian Government’s National Landcare Program, have joined forces to work toward securing the future of a critically endangered native spiny crayfish. The Fitzroy Falls Spiny Crayfish is naturally very rare, having been identified as only occurring within a 12km stretch of creek in the Southern Highlands. Recent surveys found that the crayfish seem to have drastically declined in numbers, likely due to the current dry conditions, however the cumulative impacts of predation by carp and yabbies, trampling by livestock and the loss of cooling vegetation on the water’s edge have made it very hard for them to get through stressful events like drought. The new 12 month project is now underway and the community is invited to get on board and learn more about this ancient crustacean and others like it. Significant support is now available to land managers with property adjacent to key habitat. Funding for important farm infrastructure such as riparian fencing to exclude stock from the waterways and the installation off-stream watering systems will in-turn provide much cleaner and accessible water quality for livestock, as well as protecting the creek from trampling. Planting some tough local species along the creekline will encourage bank stability, keep the aquatic food-web cycling and improve water quality to support the crays. This is a big opportunity to work with Local Land Services to be a key part of securing the future of this unique spiny cray. A raft of other exciting activities are proposed that the broader community can get involved in to show their support for this rare and intriguing species - an icon of the Southern Highlands area. These include public artwork, school visits, public talks and information days to share knowledge with the local community. An endangered freshwater fish has made a return to River Murray waters in New South Wales for the first time in more than 10 years under a new project to help save it from extinction. The Murray Hardyhead is a small fish (up to 9cm long) with an amazing ability to tolerate saline water. It has been listed as critically endangered in since 1999 and has not been seen in NSW for more than a decade. It currently survives in just a handful of places in northern Victoria, and in the Riverland and Lower Lakes in South Australia. But a new project has relocated a small population from South Australia’s Riverland to an environmentally-watered wetland in far western NSW. Nearly 1,000 Murray Hardyhead were successfully collected from South Australia and released into NSW with the hope that they will establish a population in NSW waters. The first follow-up monitoring event to determine the initial success of the translocation will be undertaken in December with monitoring to continue during 2019. The relocation is a joint project involving the Commonwealth Government, the NSW Department of Primary Industries Fisheries, Western Local Land Services, the SA Department of Environment and Water, Aquasave - Nature Glenelg Trust, the Murray Darling Wetlands Working Group, and the owners of the Wingillie Station in western NSW. Wingillie Station is owned by the Hazel L Henry Farmland Nature Refuges Trust, which has been working with the Murray Darling Wetlands Working Group and Commonwealth Environment Water Office for several years to improve the condition of the floodplain and wetland habitats across the station. The generous support and assistance from the Trust has been critical in the success of the project. Stage two of a Murray Crayfish conservation stocking program has been completed with over 200 Murray Crayfish relocated in the Murray River to more poorly populated areas downstream. Murray Crayfish are a native freshwater species endemic to the Murray-Darling Basin. They are the world’s second largest freshwater crayfish, growing to three kilograms in weight and can be easily identified by their large white claws and spiny green and brown abdomens. We’re running this conservation translocation program because Murray Crayfish have very low dispersal abilities and occupy small home-ranges, which means they struggle to recolonise areas where their population has declined. Continued monitoring will be undertaken to determine the success of the project. 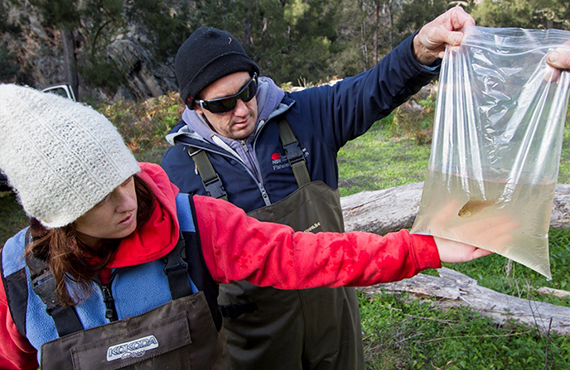 The translocation project is a collaborative project with DPI and Aquasave – Nature Glenelg Trust, with funding support from the NSW Recreational Fishing Trust. See Murray Crayfish for more information. DPI is continuing its conservation stocking program for Silver Perch and Trout Cod in NSW, with fish produced at the Narrandera Fish Hatchery. 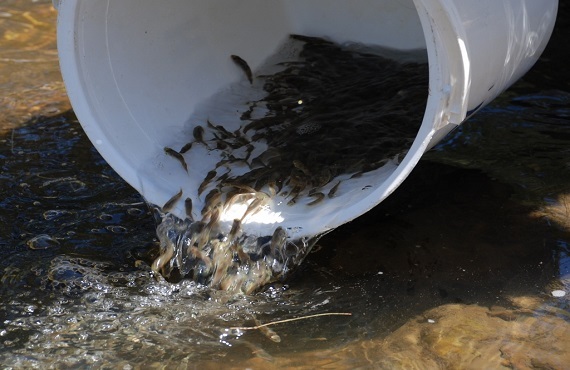 Between 2016 and 2018 a total of 120,000 Silver Perch fingerlings were released into the Namoi River between Gunnedah and Narrabri. Between 2015 and 2017 over 46,000 Trout Cod were released into the Upper Macquarie River. See Silver Perch and Trout Cod for more information. 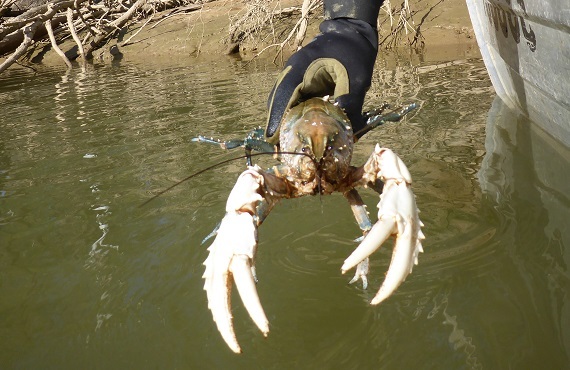 A two year Murray Crayfish conservation stocking program commenced, with 200 Murray Crayfish being moved from an area where they are abundant to a site downstream in the Murray River which has suffered a significant decline in the local population. Murray Crayfish are an iconic Australian species and are an essential par t of the Murray Darling Basin ecosystem. They were once widespread throughout the Murray and Murrumbidgee catchments however have declined in range and distribution due to a range of environment factors, including a widespread hypoxic blackwater event which occurred during 2010 and 2011. As a result, Murray Crayfish are now listed as ‘vulnerable’ in NSW. This is the first time a stocking program to boost the population of Murray Crayfish has been conducted in the Murray River in NSW. Another 200 Murray Crayfish will be released to the site next year along with continued monitoring to determine the success of the project. See Murray Crayfish for more information, including a video of the project courtesy of ABC. DPI Research staff confirmed that Macquarie Perch in a waterway near Oberon are breeding. This has confirmed that our conservation stocking of over 19,000 captive bred fish have established a new breeding population of the species in NSW. Surveys also confirmed that Macquarie Perch adults stocked into the Bolong River are also persisting. This project has taken over 10 years of effort to achieve this significant result. See Macquarie Perch for more information.